I had the pleasure of meeting one of our favourite clients recently for a lovely dinner at Medlar on the King’s Road. I thought I’d bring one of my last bottles of a wine I was sure he hadn’t tasted. A 1971 Barbaresco Pajore from Giavanni Moresco. The wine on this showing had a strong volatile whiff reminiscent of dead mice but was typically velvety smooth palate and had exceptional length. The palate was so good that we were able to look past the very strange nose. Moresco only made wine between 1967 and 1979 and later sold his vineyards to the young Angelo Gaja who now incorporates this juice into his regular Barbaresco bottling. My guest decided to serve his wine blind. I was immediately in Piedmont but the modern style and the depth of colour of the wine threw me slightly. It was very impressive with good depth and balance with hints of smoke, graphite and wet earth. To my amazement it was actually another Moresco which he had purchased from us – the 1979. This is a very underrated vintage (more for Barbaresco than Barolo) and this was in fact very impressive. The difference between the two wines was quite startling in colour and style. The other two big successes for Moresco, the 1970 and 1974, are also along the style of the 1971. This leads to think that Angelo Gaja may have had an influence quite long before buying the vineyards in 1980. If anyone thinks we wine people take it all too seriously, here’s a new experience. We matched 7 types of retro crisps with 3 whites and 3 reds. The crisps were Frazzles, Skips (Prawn Cocktails), Quavers (Cheese), Squares (Salt&Vinegar), Monster Munch (Pickled Onion) and the non-retro Doritos (Chilli Heatwave). The aim was to decide which was the best and the worst matches. 1. Vulcaia 2011 Inama - Lovely smoky, guava flavours and a oily texture. The best match here was the Doritos (Chilli Heatwave) which emphasized the corn and spicy flavours. The worst by majority was Skips (Prawn Cocktails) which was wrong in so many ways. 2. Trebbiano d’Abruzzo 2005 Valentini – earthy, Provençal herbs, viscous and rich and a touch tannic. This wine brought out the bacon flavour in the Frazzles. The Monster Munch made this wines taste like urine and the Quavers (Cheese) didn’t fare much better. 3. Riesling Spatlese 2008 Schmidtt – Very sweet for a Spatelese with petrol and honeyed apricot notes. 4. Barolo Gancia 1998 Molino – Fully mature, earthy, barnyard with medium weight and firm tannins. The Squares (Salt&Vinegar) did best here with the savouriness of the wine and the saltiness going hand in hand whilst the vinegar calming the high acidity in the wine. This was probably the most crisp-friendly wine although the Quavers (Cheese) were completely overpowered. 5. Serpico 2003 Feudi San Gregorio – big full blockbuster from Campania near Naples. The Doritos (Chilli Heatwave) was the clear winner in this one with the spicy chilli matching the spicy exuberant fruit of the wine. The Skips (Prawn Cocktails) once again were left wanting although the Monster Munch (Pickled Onion) were also pretty vile. 6. Rioja Gran Reserva 890 1998 La Rioja Alta – Ripe banana and spicy oak with great vibrant acidity. The Frazzles came top again with the smoky bacon complementing the sweet spicy oak flavours. The Monster Munch (Pickled Onion) once again clashed in a big way. We probably wouldn’t recommend trying this at home unless you have something pretty hearty to follow for dinner (we’re off to Tooting High Road for a curry). Retro crisps were clearly not created to match fine wines, however, Frazzles and Doritos were the most wine friendly. Sweet wines such as the Spatlese Riesling provided the most extreme clash whilst the Barolo proved its versatility. Next time will be Retro Chocolate!!! A dear friend kindly opened these two great bottles on my recent visit to his home town. This was a duel not only of two excellent vintages, but also of Barolo versus Barbaresco and most importantly of two highly respected producers. There is no doubt that the 1964 vintage is generally more highly regarded than the 1961 but the Gaja 1961 has received great reviews including a recent 100 point score from James Suckling. When the Gaja was opened it clearly had a darker and denser colour than the Cappellano which also had a very healthy plenty of depth of colour of its own. the Gaja seemed atypical of the Nebbiolo colour especially in that era. On the nose the Gaja was straight out of the blocks with a brooding dark nose of coffee and tar whilst the Cappellano was much more subdued in its soft, floral, minty, charm. There was an arrogant, alpha male character to the Gaja which initially overshadowed the cooler, more restrained demeanour of the Cappellano. As the wines grew in the glass the Gaja was still loud but faded into a fairly one dimensional character. The fruit was clear and vibrant and tannins noticeable but it lacked complexity. The Cappellano meanwhile was growing in confidence and stature. The fruit sweetened and gained intensity whilst the palate became more balanced and longer on the finish. There was no doubt that the Cappellano had overtaken it precocious rival. The Gaja, whilst still very good was seemingly unable to shake off the limitations of what seemed a clear addition of Barbera in the blend. Victory for 1964, perhaps; glory to Barolo, possibly; one nil to Cappellano, definitely. This event was my first exposure to Robert Parker as a speaker. It was a complete coincidence that I happened to be in HK during a series of events he was hosting on his Asian Tour. I liked his style. He spoke eloquently and was very good at playing to the local crowd. He called HK the new hub of wine (a title that once belonged to New York and London). He was also adamant that Cantonese cuisine was one of the best in the world to match with wines especially French wine. In fact, famous French chef Joel Robuchon once said that he felt that Cantonese cuisine married better with French wines than even French cuisine. Controversial! I enjoyed Parker’s down to earth style. I also agreed with his firm belief that we often let wines age too long and should just open and drink them. The older I get, the more I value the vibrant youthful fruits balance of wines especially in the case of Burgundy. He was also adamant that wines should be balanced from the off especially when talking about quality/ripeness of tannins. The selection was based on showing off a few noble grapes and their differences depending on the terroir. It included a few wines that I’d never tasted and really impressed me (ie: Marcassin and Giaconda). Mineral, steely, ripe, clean fruit, wet stones, searing acidity tight steely intense palate and a warm finish. Plenty of precision and depth. Toasty oak – not yet integrated for me, ripe apples, honey, some wax, minerals and lemon grass. Nice balance and a vibrant dry finish. The wine has undergone 100% malolactic and has had 22 months lees contact with 30% new French oak. Stoney, marzipan, more honeyed than Giaconda. Its broader and sweeter with some tropical fruits coming through. Good kick of alcohol but a a very silky texture. Fascinating wine and unique. Great texture if a little bit too sickly. Very closed. Ripe, crunchy apples, citrus, exotic. Soft not as pure and clean as previous two wines and overshadowed buy both but still an impressive wine. 25% new oak. Violets, sweet raspberry jam, broad, with hints of cigar box. Good balance and impressive depth of fruit. Ripe Cabernet. Perfumed sweet crushed violets flowers with plenty of toasty oak. Alluring and charming. Very pretty with minerals infused red fruits. Superb elegance and balance. Lovely to drink now. Lovely, ripe Merlot. Broader than LFP and excellent balance. Full, good minerality, noble tannins and very long finish. The most Pomerol of Pomerols (according to an off the record producer survey by Neal Martin). Pure, ripe, tight tannic but top quality tannins and a myriad of of flavours. Very classy with a long finish. Needs plenty of time to show it’s pedigree. Focussed and pure. Red fruits, animal, blood, spice, crushed flowers with zesty tangy sweet tannins. Tantalisingly good. This is made from vines back to 1860. Good, earthy, complex with ripe fruit and notes of sage. Excellent especially in 2005. This was organised purely to celebrate the end of summer and the recent nuptials of some good friends from the trade. Sam Harris from Zucca Bermondsey treated us to his now legendary hospitality with some amazing food. He sometimes uses these private dining room events (which holds 10 people) to experiment with new dishes and, as ever, we were utterly spoilt. 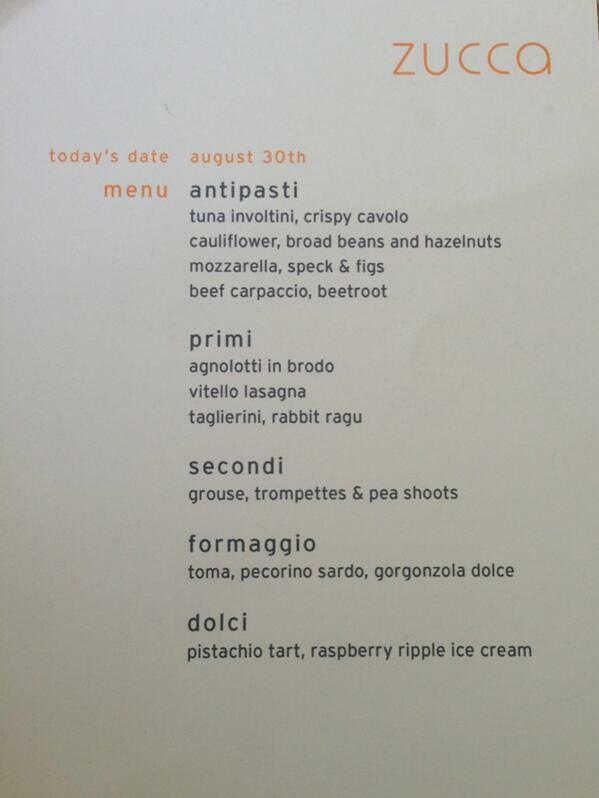 The use of nuts and pulses was fascinating, the pastas were as knee-weakening as ever and the grouse was to die for. All courses we’re finely prepared by the very talented sous-chef Simon. The wine selection is left to the guests and there is rarely a shortage of variety or quantity at these events. Also great to see that all wines performed really well on the night. Very rare to have no duds with this amount of wines from varying ages. Good solid house bubbly from Zucca- A refreshing start to the evening. I haven’t had many 98 bubblies but if this is anything to go I need to try more. Lovely finesse and elegance with good fruit to balance. Intense honeysuckle and greengages. Viscous with a piercing acidity to balance. Very good indeed. Luscious, California-style Chardonnay. I found the 2010 very stylish and balanced. One can age this but lovely to drink now. Impressive minerality and holding together well. A testament to the age-ability of top white Burgundy. Another great surprise and still alive. Very soft, earthy fruit and clear sous-bois Pinot character. To drink now but impressive for a village wine. Ripe, sweet, appealing fruit. Very nicely made. A top quality Chianti and good freshness for the vintage. I know a lot of people are not fans of Tignanello but I am. It may not be the best value wine when buying older vintages as demand has heaped upward pressure on prices. However, at release prices, this is solid, honest Super Tuscan that rarely disappoints. The 1993 is drinking beautifully now with a soft, spicy fruit disposition. I often find 2000 Tuscans sweet and soft and flattering but rarely exciting. Sassicaia is my favourite of the Super Tuscans and the 2000 was very charming with delicious ripe damson fruit but decent grip and length. Very good classic. elegant Bartolo from a decent vintage. Old school mushroom/earth nose with a medium weight. Not as good as the monumental 1989 but still excellent. Another nice surprise. Sweet, forward and velvety fruit. Not my favourite style of Barolo but very pleasant wine indeed. Memory gets a bit hazy at this stage but I remember this wine being perfectly mature with scents of rosewater and Asian spice. Medium bodied on the palate but nowhere near as good as the Falletto 1982 white or obviously the red labels. This is from one of my favourite properties from Tuscany and this wine was drinking perfectly. Full of black cherries and minerals. This was a tremendous bottle and arguably the wine of the night. Very focussed and vibrant for its age. Great grip and depth. Stunning. Stunning, love Madeira and worked very well with the pistachio tart and finished the evening perfectly. Many thanks to all for the fabulous wines that everyone brought and of course to Sam and his team for a truly memorable evening. Met some dear old friends at Gauthier Soho for a lovely meal. The food was restrained and pure and nicely cooked. The wine all sang and were first time bottles for me except for one. We started with a 1975 Champagne from Christophe de Valicourt. This is a small house I hadn’t heard of before and prove a real revelation from a classic Champagne vintage. Although showing a slight touch of oxidation, it has a pleasant nose of toast, ginger and almonds. The mousse was delicate and still fresh. Nice start. The white was a Chablis Les Preuses 1992 Dauvissat-Camus. Apart form an excellent magnum of 2005 Les Clos last year, I’ve never really been a huge fan of Dauvissat (I’m a complete Raveneau nut and rarely say the point). However, this bottles was very impressive, with a stony, fresh onion skin on the nose followed by an impeccably balanced palate which was fresh and silky. We also went back to this wines at the end of the meal, over 2 hours later, and it was still holding together with nose now reminiscent of rich clay and more oily on the palate. The Barolo Vigna Rionda 1970 Giacosa was solid and and very pleasant. A good bottle with a light colour and pinkish hue, with a delicate fragrant nose of rose water and spiced fruit. It was medium bodied and chewy on the palate. Good but nowhere near the quality of a Santo Stefano 2 years ago which is the only other 1970 I’ve had from Giacosa. We finished with some cheese and a tasty bottle of Sassicaia 1982. This remains one of my favourite Sassicaias along with the voluptuous bombshell 1985 and the classic 1988. It is a real crowd pleaser with depth. Classic Cabernet aromatics of cassis with a finely balanced palate with soft, sweet tannins. A real treat! Our Tenuta dell’Ornellaia UK importer friends hosted a fascinating tasting last week featuring an interesting array of vintages. The tasting was led by GM and agronomist, Leonardo Raspini and and Winemaker, Axel Heinz. The tasting started with two vintages of Le Serre Nuove dell’Ornellaia whose inaugural vintage was 1997. These second wines always struggle in cooler vintages and this is no different. The nose is slightly dusty, lacking definition of fruit. The palate is four-square and lacking mid palate fruit. Light and easy drink to enjoy young. Much better fruit on the nose with stoned fruit. Very soft and pleasant on palate. Holding up nicely but needs drinking up. The estate’s Flagship wine, Ornellaia, started in 1985. I’ve tasted the 1985 on a couple of occasions and it is impressive with vibrant fruit and decent power for a first vintage. Our tasting last week included 2010, 2009, 2008, 2007, 2004, 2001, 1999, 1990. The latest release was born from a very late harvest of about 10 days later than normal. It also boasts a very high percentage of Merlot of 40%. It is quite intense and pure with sweet perfume, lead pencil and goudron. Tight, focussed, elegant and vibrant. This very pleasant and will probably be drinking earlier than the great 2006-2009. The 2009 is a blockbuster with a heady, candied nose of flowers. It is tannic with a good depth of fruit and high alcohol but all in balance. A bit OTT at the moment and needs time to settle. This was a bit closed on nose lacking definition and expression. On the palate, however, it had great energy power, depth and density of fruit. Very aromatic development of fruit on the palate and a long, intense finish. This will be very fine indeed and a few years. The 2007 was appealing from the off with a warm, chocolate, coffee character on the nose. Charming, harmonious and with lovely softness of tannins and balance. Will develop and have a wide drinking window. Intense, focussed, pure and simply alluring on the nose. Very classy wine with grip and a tight, composed structure. Great development of intensity and flavours on the palate. Very fine indeed and Best in Show on today’s showing! This vintage was affected slightly by frost in Spring. Sweet almost Port-like nose with chocolate notes. Sweet, luscious with velvety tannins and nicely balanced. Drinking perfectly now although should keep for another 5 years or so. A touch faint on the nose and slightly vegetal but ok. Pleasant, soft and opulent on the palate. Just balancing grip and moderate finish. Perfectly acceptable although not great. A nose of mint, eucalyptus, sous bois and sour cherries. Slightly dusty tannins and candied sweetness on palate. Fresh but lacking density of fruit. Drink up. Managed to catch up with a dear old friend passing through town. His generosity of opening rather glorious older Bordeaux pushed the ante for me to bring some decent stuff. We started with an Ockfener Bockstein Kabinett 2005 Zilliken, which was drinking beautifully. It had a lovely charming, creamy, ripe apple nose and a brilliant balance and depth of fruit. It seems in a perfect place and I don’t see the point of ageing this longer. A great advert for the quality of the 2005 vintage. As my host is a massive Bordeaux man, I decided to stick to Burgundy and Barolo. The Charmes Chambertin 1969 from Drouhin instantly showed that it was a bottle which defied it’s external looks and had clearly been well cellared. The nose on opening was clean and reticent but the faint Pinot character was promising. The Barolo Ris 1947 Borgogno was anything but reticent on decanting and showed an explosive bouquet of mushrooms, tea and tar. The Charmes seemed a bit of a tease with the nose remaining shy in the glass whilst the palate was fresh and had decent balance but lacked a bit of soul and texture. Sadly the bottle stayed the same after an hour and a half in the decanter. It was a pleasant drink but failed to deliver excitement. The Barolo, on the other hand, was a complete show off. A very hedonistic, sweet Barolo which defied it’s 66 years of age. It had low acidity and soft, rich, cinnamon spice fruit. What a gorgeous drink! It stayed like this for about an hour and then the fruit started to fade and it became a touch flat and sickly. A top Sunday night in! This is the third instalment in our February Brunello tastings at the property of Le Ragnaie in Montalcino. The thought of attending the Benvenuto Brunello tastings (always held the week after our event) fills me with dread so this is a much more civilised alternative. We taste anywhere between 24-30 wines to give ourselves a good idea of the quality of the latest vintage. The wines this year were initially tasted blind for a few minutes in flights of four and then revealed to allow us to taste for a few more minutes with the wines still in the glass. The Brunello 2008 vintage is quite cool and that combined with a grape like Sangiovese which is naturally high in acidity can make things awkward. The better wines showed some very talented wine making that kept the fresh and mineral character of the vintage. Some of the wine however were overdone and lacked elegance and balance. These will prove to be good early to mid term wines that will drink before the 2006s and the 2007s. The overall quality and consistency is better than 2005 but generally lower that the 2006s and 2007s. 21. Cerbaiona. Most complex and confident nose. But fading and gets sweeter. Getting a bit sickly sweet. Sappy. 90?